FInancial aid letters are often confusing. I believe many colleges and universities intentionally make financial aid awards hard to decipher to trick families into thinking that their institutions are being generous even when they aren’t. Since this is the time of year when students are receiving their financial aid letters, I wanted to share with you what you should find in a model financial aid letter along with examples from Chapman University and George Washington University that illustrate what families all too often get instead. The following award letter comes from Chapman University in Orange County, CA, which has become a hot school. The letter doesn’t include Chapman’s full cost of attendance, which was a hefty $60,573. The letter provided the tuition/fees and estimated room/board of $12,000 to $13,500, but not books, travel and personal expenses. Some schools omit mentioning any costs including tuition in their award letters! You can’t determine if an award is a good one unless you know what your EFC is. This family’s EFC was $12,617. Ideally, the family would only have had to pay $12,617 to attend any school. Realistically, however, most students will have to pay more than their EFC, but the closer to this figure the better. 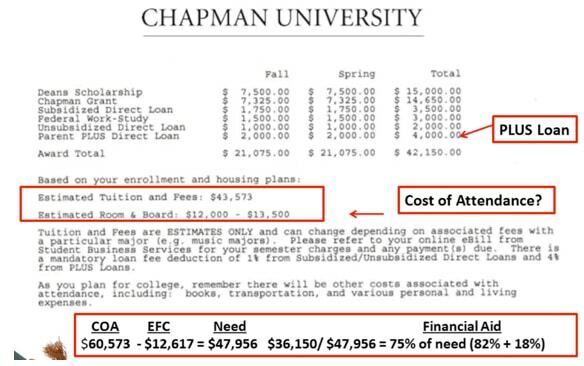 To attend Chapman, the family’s need was $47,956. Any student can qualify for the Direct Unsubsidized Loan (current interest rate 3.86%) and it hardly should be used by aid packagers to reduce a family’s obligation. The Direct Subsidized Loan and the Perkins Loans that are reserved for lower income families are okay to be in the package. Chapman also inserted the Direct PLUS Loan in the package ($4,000). Schools often put this loan in their award letters, but this is misleading. The PLUS Loan is the federal loan for parents that currently has a 6.41% interest rate. Parents must also pay an additional 4.28% fee for any amount that is borrowed. This is a poor award, but you need to compare it to what applicants typically receive at Chapman. 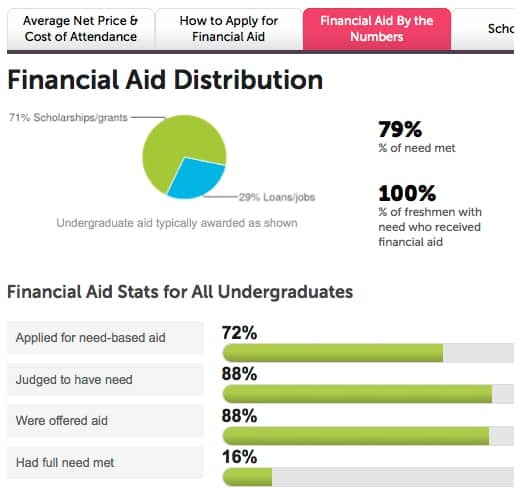 You can do this by checking the school’s financial aid statistics at the College Board or COLLEGEdata. 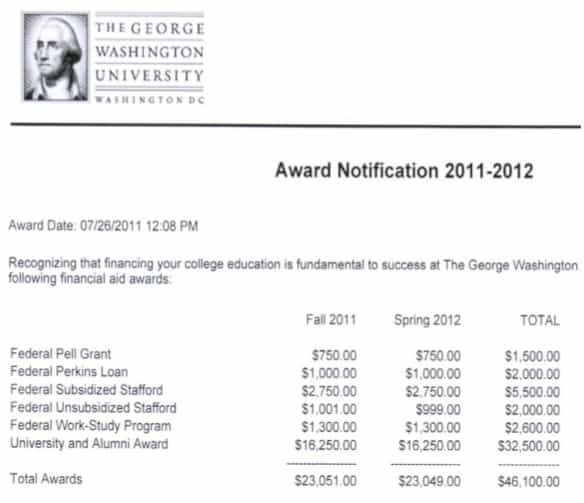 At first glance, this award letter from George Washington University in Washington, DC, also looks generous. It appeared that the applicant would receive an award of $46,100, but this school also failed to include its cost of attendance which was $58,690 for the 2011-2012 school year. The EFC for this family was just $4,100. Ideally, the family would only have had to pay $4,100 to attend any school. Realistically, however, most students will have to pay more than their EFC, but the closer to this figure the better. In this case, the family’s need was $54,590. I would like to obtain more financial aid letters (good and bad) that I can share. Please email me (Lynn@Thecollegesolution.com) if you have any you can share. Who Isn’t Filing the FAFSA? If schools are accepting federal and state funding (of any sort) they should have to change the financial aid award letter to one that clearly identifies aid and separates aid that is not repayable- from aid that is. Why do Universities believe that a laon is financial aid. It is not. 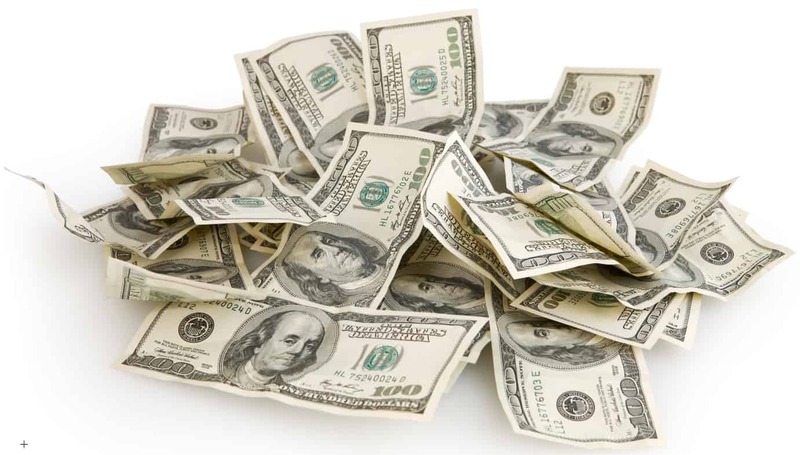 Is my bank or auto dealer giving financial aid when I invest in an automobile- NO- it’s a LOAN. I heard about a first generation college scholarship, but can’t seem to find anything on how to apply. My wife is Swiss. 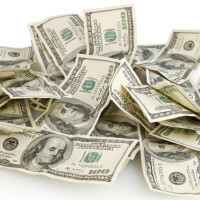 There are private scholarship search engines that you can use to look for awards for specific types of students, but I must tell you that the vast majority of college money comes from the federal and state governments and the colleges themselves. It would be more valuable to know if you qualify for government grants and to understand how to evaluate the generosity of individual schools. These are topics that I’ve covered a lot on my blog. I believe that you should also point out that the work-study amount is not guaranteed. My daughter’s work-study job is working in the library and she was offered work times that conflicted with her classes. Since she could not accept those, she was only offered 6 hours per week and was told that she could try to pick up hours by subbing for others who couldn’t work a particular shift. She didn’t make anywhere close to the work-study amount that was on her financial aid offer. Thanks for sharing Nancy. That’s a very good point you made! I hope your daughter has better luck with work-study next year if she will still be in college.